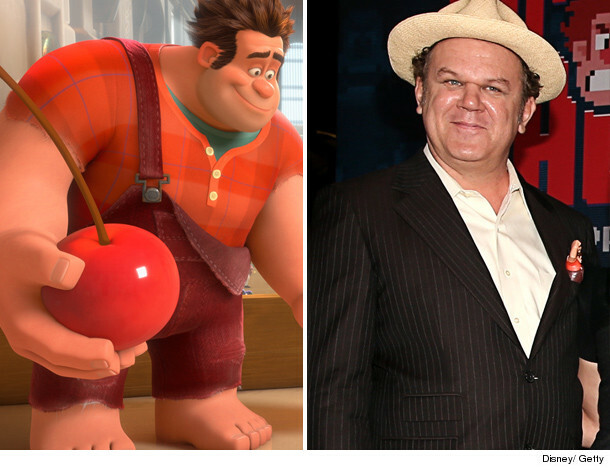 When we first saw the trailer for the animated film "Wreck-It Ralph," we were just as excited as most kids -- classic video game characters from our childhood in a new Disney movie? Awesome! 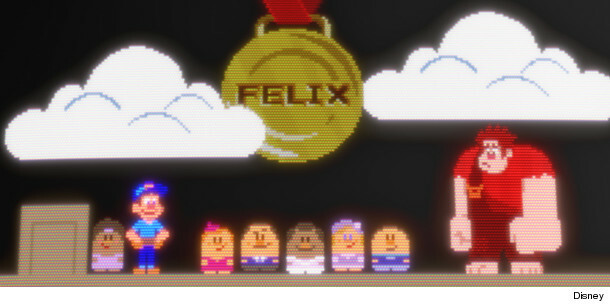 The flick, out Friday, follows 1980s game bad guy Ralph (voiced by Oscar nominee John C. Reilly) as he leaves his bad image behind, heading out on a quest to become a hero and earn his very own medal -- just like game hero Fix-It-Felix (Jack McBrayer). 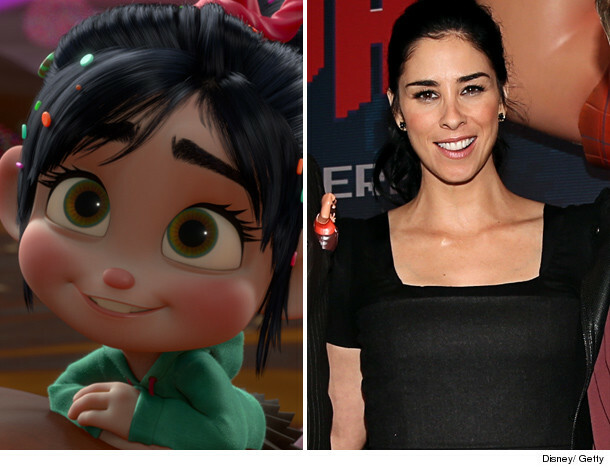 On his journey through other arcade games, Ralph encounters worlds and characters very different from his own -- including the feisty race game kid Vanellope (Sarah Silverman) and the overly-intense war game star Sergeant Calhoun (Jane Lynch). toofab caught up with the stars of the movie where they shared their real-life video game history, what it's like to see themselves in a Disney movie, and talked about their kid fans! John: "I remember when it went from pinball machines to Space Invaders. That was the first one like - 'Oh my God!' There were no computers, no cell phones, I didn't even have VCR, so the concept of being able to manipulate what was on a television screen was this outrageously new thing. I spent a lot of money on that, lot of change. Pac-Man was the next big one after that, they just kept coming -- Centipede, Asteroids, and then Defender. I played a lot of Defender. The first time you could go in reverse! Your spaceship could go that way then it could double back that way. I would start out being really good at games and then get worse and worse the more I played..."
Sarah: "I grew up with Atari and arcade games. We lived near ... an arcade called Space Center and we used to go there in the evening, my sisters and I. I loved it. There was a game called Joust that was in our local Dairy Queen that I mastered between cones." Jane: "I'm not a gamer. It was an education for me. I'm not an arcade person, I never was as a kid. I played Asteroids in college ... but I was usually very drunk. I barely remember the game." Sarah: "It's funny the genesis of it [her character]. Little by little, the eyebrows appear, and her black hair, I was like wow! It was so cool. It makes you all the more invested. It's so exciting to be in a Disney movie. 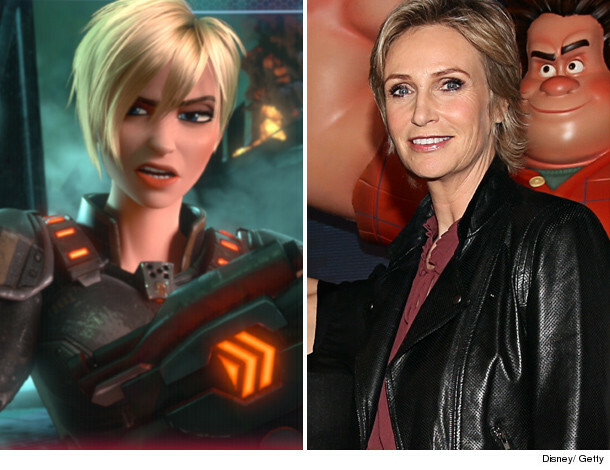 Jane's character looks just like Jane, it's really neat. Just to be part of a Disney movie is cool. " Jane: "To be in a Disney movie is a pretty amazing thing. We all grew up with them and I'll maybe be on shelf next to 'Jungle Book' and 'Snow White' and 'Cinderella.' It's pretty amazing. [Sgt. Calhoun is] An idealized version of me, how I imagine I go through life. In fact, watching the movie I was with my wife and I said 'I look great!' She said, 'Honey it's animation...'"
John: "My voice gets recognized already! Most of my movies they should not be seeing, but they hear my voice and are like 'You're Wreck-It Ralph!' They have the trailer memorized, they quote lines to me. [It's like] You're 8-years-old! How do you know that? I really enjoy when kids come up to me and recognize me for my work. And that's been happening more since 'Talladega Nights,' younger kids, especially like smart alec 12-year-olds. I welcome it." Jane: "[My wife and I] were in London and took a walk to get some coffee, and there were about 20 giggling English schoolgirls following us going 'Is it, is it, is it?' That blew my mind 'cuz I felt like I was on a different planet. They wanted pictures and everything, I was very happy to do it." Sarah: "I love when kids approach me, much more than when, you know, creepy 50-year-old men... (looks around) I mean, no offense! (laughs) When it's kids or teenagers, it's so great. I love when young girls are touched by stuff I do or feel empowered by anything. That's my most proud moments." Be sure to catch the heartwarming, fun for the whole family "Wreck-It Ralph" -- also starring Jack McBrayer, Ed O'Neill, Mindy Kaling, with appearances by your favorite game characters like Zangief, Bowser, Sonic, Q*bert and more -- in theaters this weekend!